We love our dogs, so we want to give them treats. 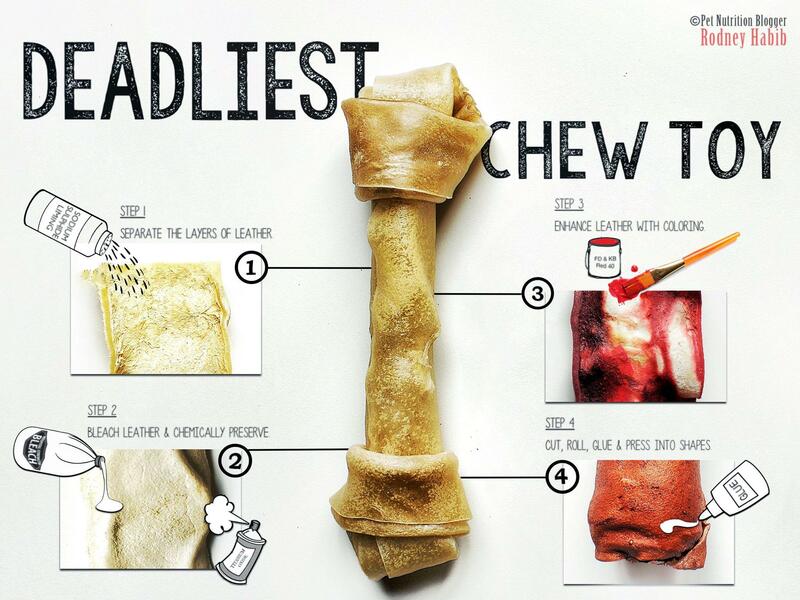 Rawhide seems like a good option for a dog that likes to chew. It’s cheap and on the shelf at every supermarket and pet store. So it must be okay, right? Dig a bit deeper and you find that a host of toxic chemicals is used in its production. Not healthy for Rover. And that’s just the beginning. It’s true the effects can be serious. There is a higher choking risk because of its consistency, but it’s not just the choking risk. Rawhide causes vomiting and diarrhea for some sensitive dogs, Rawhide can break one or more of your dog’s teeth, causing pain (and high vet bills), and large chunks of this indigestible ‘toy’ can be swallowed hole, leading to intestinal and stomach blockages, serious illness or death. Some people think rawhide is made of a beef byproduct or that it’s dehydrated meat. Wrong on both counts. It’s actually leather. It might have ‘raw’ in its name but its not at all raw. It’s highly processed. Independent tests have found nasty chemicals like lead, arsenic, mercury, chromium salts, formaldehyde and other toxic chemicals in rawhide. It’s not considered pet food, so rawhide is not covered by the Australian Standard for the Manufacturing and Marketing of Pet Food, which outlines requirements for production, food safety, nutrition and labeling. Handmade healthy pet treat company in Melbourne, Laila and Me, is asking dog owners to pledge to find out the ugly truth about rawhide, help raise awareness and then throw any rawhide treats they have in the bin. In return, they offer a $10 discount on their treats. Stay tuned for our next blog post with some great alternatives for dogs who love to chew!